D!Play ist vollständig in C# geschrieben, verwendet das .NET Framework 4.0 und nutzt die BASS24 sowie BASS.NET Libraries. – Nix verstanden? Nicht schlimm. – Er spielt Musik, und das mit den modernsten Mitteln. Er läuft auf Windows XP, Vista, 7 und Windows 8. D!Play unterstützt bis zu 3 Soundkarten oder auch Soundkarten mit 3 Ausgängen. Es stehen diverse Effekte, unbegrenzt viele CUE-Points, ein BPM Zähler sowie ein Auto Crossfader zur Verfügung. Jede Funktion lässt sich frei auf eine Tastenkombination legen. Unterstützung für MIDI/ DJ Consolen ist ebenso inklusive wie ein Effektprozessor. Derzeit fehlen allerdings noch die Effekte Flanger und Reverb. D!Play ist Freeware für kommerzielle und nicht kommerzielle Nutzung. Über Feedback freue ich mich jederzeit! Download: Beta Version 0.5.0.2 -> Link. D!Play supports up to 3 sound cards or one sound card with up to 3 output channels. D!Play gives you several effects, unlimited CUE points, a BPM counter and an auto crossfader. You can define keyboard shortcuts for every function. Support for DJ consoles is on its way but not available. Some more effects (flanger, hall) will follow as well. D!PLay is freeware for commercial and non commercial use. Unzip all files from the 7ZIP archive to any folder on your hard disk. It is best so have D!Play sitting on the same hard disk as your music library. Please ensure that you have the Microsoft .NET Framework 4.0 (or later) installed. Launch DPlay.exe and go to Menu: ‚Edit>Setup…“ and set up your sound card(s) accordingly. You can also configure the keyboard shortcuts as you like. You can set every button and slider to be controlled by a keyboard shortcut. The MP3 files can be stored in different locations (drives / shares) and in sub folders. D!Play will search all sub folders for usable files. When adding new files they will have to be processed before they can be played. This means D!Play will analyse all files (Tags, Duration etc.) and generate the peak data. Those are saved in the library so this process only happens once you add a file to the library. When adding files they are visible immediately but will have the „processing“ icon (cog wheel). As soon as preprocessing finished the icon will change to the default (star) and you can drag them to a player or play list. a) Drag & Drop them to the library from any explorer window. If you’re dragging files to the library, that it already contains they will not be added again. Therefore – if you keep all MP3s in one folder – you can simply drop the folder again, to update the library with the new files. Note: If you close D!Play while it is processing Files it will continue doing so if you start it the next time. If the processing of a file is finished (see ‚Adding MP3 files‘) you can drag them to any of the three players (deck A,B or the monitor). The monitor will start playing automatically from the beginning or the ‚Start Cue Point‘ (see ‚Using CUE Points‘). If you drag it to one of the two decks it will be loaded and the ‚Start Cue Point‘ will be selected automatically. To play press the ‚Play‘ button. To ’scroll‘ through the file (eg. move the play position) right click onto the peak graph and drag it to the left / right. If a file has less than 35 seconds remaining the playback time info will start blinking in red. It’s up to you to get the next track playing or use the auto x-fader as described in ‚Using the Auto-Crossfader‘. If a file was played for more than 20 seconds (in deck A or B) it will be marked as played and the ‚Last Played‘ time will be set to the current date / time. Each deck has a play list. To open it click on the ‚Play List‘ button below the deck. You can also select multiple files in the library and right click them. ‚Shuffle to playlists‘ shuffles the selected songs equally to the play lists. ‚Add to playlists‘ adds them equally (as you sorted them) to the playlist. To load a file from the play list into the deck double click it. (It will stay in the play list.) To remove a file from the play list select it and press ‚Del‘ on the keyboard. D!Play supports unlimited cue points per song. Cue points have three attributes: Position (seconds), Description (text) and Type (Normal, Start, End). Start: This cue point is automatically set as soon as you drag a file to the deck. Additionally the monitor will start playing from this cue point. End: The auto cross fader will start fading as soon as this cue point is reached. To display the cue points for a song drag it to one of the two decks and select the ‚Cue Points‘ button below the deck. To add / modify / remove a cue point (if removing / modifying: select it first!) and then right click into the cue points list. Choose the respective option. If adding a new point the current playback position will be used as cue position but can be changed manually. The build in cross fader allows you to mix songs playing on deck A and B without a mixer. If the x-fader is in the middle both decks are at 100% volume. If the x-fader is completely on the left or right, the respective channel has 100% volume. To reset the crossfader double click on the text ‚Crossfader‘. The build in crossfader works even if you use multiple soundcards but you should ensure your mixer is set correctly. 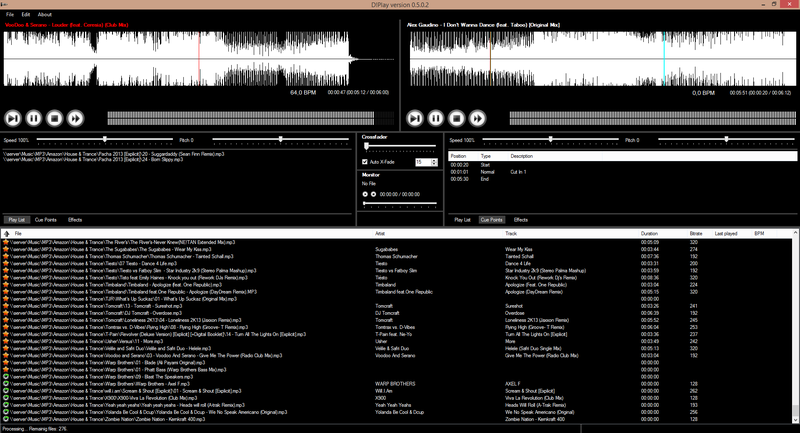 To use the auto x-fader drag some files to the playlists of *both* decks. Optinally load a file into each player and press play in one of them. To enable the auto crossfader tick the box ‚Auto X-Fade‘ above the monitor. If you have no files in the players the auto x-fader will load the first file from each deck’s play list and start playing on deck A. You can set the x-fade time next to the check box (this is seconds). The x-fade begins n seconds before the end of the song or before the end cue point. The auto x-fader will play as long as either list contains files. The played files are removed from the play lists. Tolles Teil! Ich bin schwer begeistert. Nur eines gelingt mir nicht: Das Hinzufügen mehrerer Ordner zur Library – (Right click in the library and select ‘Add…’. – You can select multiple files and folders)… funktioniert einfach nicht, nur reine MP3-Auflistungen werden übernommen, was mach ich falsch? Es sollte funktionieren… Was ist denn alles in dem Ordner drin? Wie lange dauert die Operation? Wo kommt der Ordner her? Das Verhalten ist immer gleich: Ziehe ich per Drag & Drop einen Ordner in den Bereich File des Players erscheint dort das Verknüpfungssymbol am Mauszeiger und wenn ich loslasse passiert nix mehr, auch wenn ich mehrere Miuten warte. Im Versuchsordner sind zwei Unterordner mit jeweils ca. 10 MP3 Files. Der Ordner selbst liegt lokal auf einer NTFS-formatierten Partition, OS ist Win 7 64 bit. Hab es aber auch schon auf einer 32 Bit version probiert. Ergebnis ist gleich. Woran kann es liegen? Interessant: Ziehe ich den Ordner in den Playlist-Bereich und lasse dort los, erscheint da der Order-Pfad (ohne Unterordner und files). Mach ich irgendwas falsch? Ich kann auch gerne einen Screenshot schicken, wenn ich Ihr email-Adresse bekomme. Danke! Habe gerade das Update R1 hochgeladen. Bitte mal ausprobieren. Der Import funktioniert mit dem neuen Update auch per Drag & Drop und ist auch viel schneller als vorher! Danke! sehr gut, allerdings würde ich eine suchfunktion gut gebrauchen da ich viele mp3s habe. Diese ist doch schon drin…? Irgendwie bekomme ich aus box.com nichts runter geladen. Weder FF noch Chrome noch Opera …. Bitte mehr dropbox benutzen, da geht es wenigstens, auch wenn ich dropbox gar nicht sympatisch finde!